The expression of drought responsive genes were enhanced by N application and they contributed to drought acclimation. The interactive effects of water and nutrient are crucial for plants. The aim of this study was to elucidate how nitrogen (N) status influence drought acclimation of Populus. A two-factorial design consisting of two N levels (adequate-N and low-N) and two watering treatments (drought stress and well-watered) was used, and an integrative investigation was conducted at the anatomical, physiological and molecular levels. 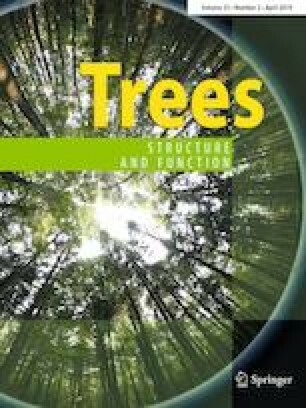 Adequate N supply alleviated the adverse effects of drought stress on root growth in poplars, which may increase water uptake under drought. Nitrogen enhanced leaf anatomical changes and stomata adjustment upon drought stress, lead to less water losses and better growth performance under drought stress. The expression levels of phytohormone signaling components and genes responsible for antioxidative systems and secondary metabolites such as phenylpropanoids were promoted by N application. The expression of abscisic acid (ABA) signaling components was induced by drought when soil N was adequate, which participated in stomata regulation and drought acclimation. The expression of indole acetic acid (IAA) signaling components also was enhanced by N application, which participated in anatomical changes of leaves under drought. These adaptive changes at molecular and anatomical levels contributed to drought acclimation in a synergistic way. Under adequate-N condition, nitrogen and carbon metabolism pathways are being recruited to combat drought, and the C-N interaction play a pivotal role in drought acclimation. The online version of this article ( https://doi.org/10.1007/s00468-019-01834-5) contains supplementary material, which is available to authorized users. This research was financially supported by National Key R&D Program of China (Grant No. 2016YFD0600105), the Start-up Project for Introduced Recruit in Northwest A&F University (No. Z111021402), and the Fundamental Research Funds for the Central Universities (No. 2452016056). For the technical assistance in dataset analysis, we would like to thank Biobreeding Biotechnology Corporation (Shaanxi, China).